Lacquer handbags bold, beautiful and pleasant to the touch. Note, however, that the application of the lacquer coating makes the leather less durable. Preparations for the care of conventional products are not suitable for patent leather - when using the surface of the bag may darken. How to clean varnish the bag? Prepare the composition for cleaning patent leather. To do this, take liquid soap, ammonia, water and mix them in equal proportions. Carefully wipe the surface of the bag resulting solution. Dampen a clean cloth with castor oil or glycerin and RUB the bag until luster is obtained. Ink stain with lacquered bags, you can try to remove using lemon juice. Update white lacquered bag will help a chicken egg. Whisk egg white and mix it with a little milk. Wipe the bag resulting solution with a cloth. For removing stains, wipe the soiled areas cut onions. Take 1/2 litre of water add one tablespoon of ammonia and 1.5 tablespoons of baking soda. Mix the solution until complete dissolution of the soda. Wipe the bag obtained liquid. Take a clean rag and lubricate the skin coated with vaseline before the appearance of Shine. To remove the stain with a patent bag you can use raw potatoes. Take a potato and cut it in half. Carefully wipe the stain. If cracks in the varnish, and the loss of the original luster it is recommended to lubricate the bag with vaseline, and then with egg white. After that, carefully Polish with a dry cloth. Once a month to eliminate dirt, wipe the bag with a soft cloth with cleansing cream. For cleaning bags you can use special tools developed to care for patent leather. Using this means you must strictly follow the attached instructions. Elegant leather bag a great addition to any outfit. It may be a very long time. But in order to handbag genuine leather looked as good as new, for her necessary care. Periodically the skin needs to be cleaned. The methods depend not only on the texture of the material, but often from the color. 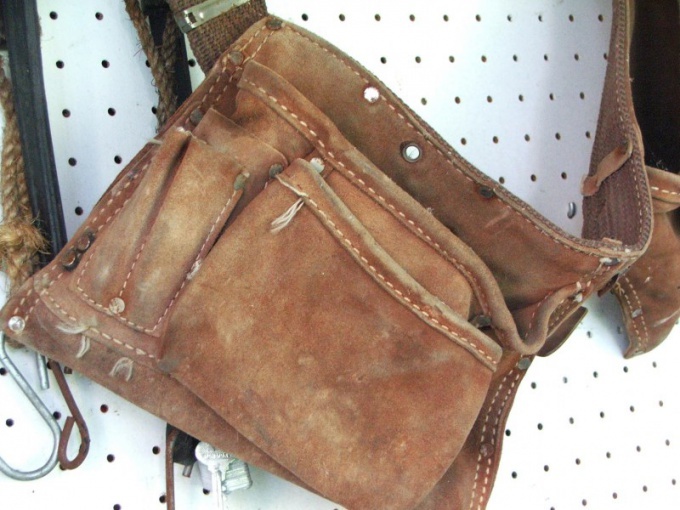 A leather bag should be regularly cleaned of dust, even if it is brand new, and there is so far no stains. This must be done after every trip to the city. Wet a soft cloth and wring as follows. Wipe the bag. Grease it with a special protective cream for the treatment of leather products. Can be applied to ordinary cosmetic cream. If dark bag smooth leather heavily contaminated, it must be washed. Make a concentrated soap solution. Soap is better to use high-quality economic and grate it on a coarse grater. Add to the solution a few drops of ammonia. Soak in soapy water a soft cloth. Treat the entire surface of the bag. Another piece of cloth soak with castor oil and wipe all the product. Castor oil can be replaced with glycerin or even vaseline. Leather for the manufacturing of various products used in a very long time, therefore, among the ways of leaving behind it there are many ancient. For example, you can clean the stain with the ordinary bulbs. Cut it in half. Attaching the slice to the stain in a circular motion wipe the bag, starting from the edges of the contamination. This method has one drawback - the smell remains, which can be pleasant not to all. With a white leather bag a few more worries than the dark. It gets dirty faster, and any noticeable marks. Wipe off dust with a damp rag, of course, possible. But it is better to moisten a cloth in the water and unboiled cow milk. Press the cloth and treat bag. Milk not only clean the product from dirt, and refresh the color. To clean leather products, you can use another way. Take an egg and separate the protein. Whip it with a whisk or fork and mix with a small amount of raw cow's milk. Soak in the obtained substance is a cloth or swab and clean the spot. Grease stains on leather goods appear frequently. To without much hassle to bring such a stain, lubricate it with rubber glue and leave it like this overnight. In the morning carefully remove the glue (it is removed without any additional equipment, you can just pry off with a fingernail). The area where there was a stain, smear protective cream. In stores now a lot of special care products for skin. But in every case it is necessary to take into account the appearance of the skin. Special shampoos designed for the treatment of leather furniture, perfectly clean and bag. Traditional methods are good for those that are suitable for any kind of skin. Suede bags should be cleaned with an ordinary school eraser. This will not only remove stains, but also to keep the texture of the material. The suede bags can also be washed in soapy water with ammonia. Bag patent leather clean just with a dry or slightly damp cloth. Remember that this bag should not be too high or too low temperatures. "Crocodile" skin, wipe with a dry woolen cloth. Wet cleaning is permissible only in exceptional cases. Bag made of genuine leather – a classic accessory that never goes out of fashion for many years. However, when choosing handbags of bright shades need to be prepared for the fact that the skin will need careful maintenance and timely cleaning gentle. Thinking about cleaning the bags out of light genuine leather, it is important to remember that these products absolutely do not tolerate excessive moisture and the use of concentrated detergents. To clean a bag of dirt, to return to her freshness and appeal by using delicate compositions made at home. Slight contamination on light skin are removed with a cotton swab dipped in warmed cow's milk. To increase the efficiency of cleaning milk sometimes adds a well beaten egg white. The mixture was thoroughly stirred, applied on the contaminated surface, taking care to avoid waterlogged skin, and leave for some time for the impact. After that, the remains of the mixture carefully erase with a dry cloth, apply the protective cream or wax. Small onion, cleaned from the husk and cut in half, remove dirt moderately. To do this, intensively RUB a bow leather bag to the disappearance of dirty spots and stains, cutting off layers of the onion as necessary. To neutralize the pungent smell can lightly wiping the bag with a cloth dampened with a weak solution of vinegar. Cleans the skin and gives it an extra glow to the lemon. Contamination on a light leather bag can be removed with a swab dipped in lemon juice. After treatment with juice, the skin wipe dry and Polish with lemon crust – the essential oil contained in it, soften the skin and make it Shine, eliminate odors. Clean very soft natural leather with the help of improvised means: equal parts of warm water, mild liquid soap and ammonia to form a composition, which well removes street dirt and light stains. When processing such a mixture it is important to prevent waterlogging of the skin, thoroughly dry the bag after cleaning and grease it a soothing and protective cream. For a more rigid type of natural leather suitable mixture of glass of warm water, a tablespoon of ammonia and a pinch of baking soda. The soda acts as a mild abrasive, removes street dirt and stains of different origin, refreshing color. However, to patent leather, such a composition cannot be used because of intolerance to the skin of the water and the probability of occurrence of minor scratches. Complex grease stains on light leather output by the gasoline and magnesia powder. Before applying the composition is recommended to test on a inconspicuous part of the bag. The mixture is applied to the stain, leave to dry, then wipe with a soft cloth and lubricate the bag with glycerine, vaseline or an ordinary baby cream. To eliminate the smell of gasoline, you can use lemon by rubbing the entire surface of the bags lemon peel. Particularly thin and delicate types of skin clean from dirt with a cotton swab moistened with cosmetic milk or lotion to remove makeup. You must ensure that in the composition of cosmetic products do not include alcohol. Skin a special candle – crocodile, snake absolutely not tolerate moisture and must be subjected to purification only specialized funds or using dry cleaning products from delicate materials.